Ligaments are strong, elastic bands of tissue that connect bone to bone. They provide strength and stability to the joint. They may be stretched, or sometimes torn. A ligament sprain happens when the fibres that make up the ligament are stretched and just a few fibres are torn. 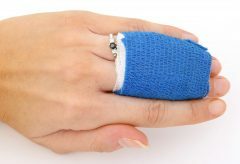 A rupture can be partial or complete. The majority of knee ligament injuries are sprains and not tears and they tend to settle down quickly. You can check some of the best knee ligament injuries doctors in India here.